Emma is the owner of The Beauty Bar. Emma has been practising Beauty Therapy and Nails for over 15 years and has a solid client base in the area, she is a fully qualified aesthetic practitioner, nail technician and salon manager. Areas of expertise within the salon: Company Director, Education, Business & Brand Development, Marketing/PR and Treatments. My treasured cook book is The Thug Kitchen... anything fresh and clean! I'd go back to the late 80's, 90's - for the rap, hip hop, Clueless in the cinema! Not to mention the other movies - Mrs Doubtfire, Home Alone! And the fashion, big brows and lots of lip gloss! I admire Sharmadean Reid, the founder of WAH Nails. I have all her books - you'll find them within the salon. 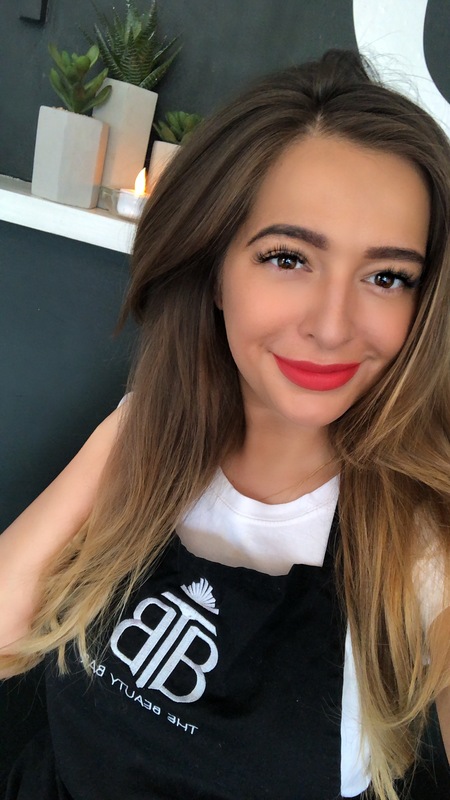 She has grown her company from a tiny room and now has franchises in Topshop and all over the U.K. She holds motivational classes to inspire other young women in business - she is a true GIRLBOSS and I love her! For beauty inspiration I look at Instagram, old movies (you'll see pics in our bathroom at other icons I adore! ), Art -including textiles and interiors, Nature - patterns in nature look amazing recreated in nail designs - you'll be amazed at what you can create originally when you look elsewhere. Business Studies and Fine Art, two subjects that let me express my creativity and ideas. I took Fine Art A level whilst studying beauty therapy and come from a creative family with lots of artists. I'm glad those subjects and my family have helped my creativity which I can express in my salons design and through some of my makeup and nail work. I have learnt far more since leaving school and being able to study at my own pace and because I want to, in interests I love. I love to study biology - anything to deepen my knowledge of how the body works and why - it's beneficial to my job but I find it fascinating - I love learning why one thing does that and why another doesn't! I like to read articles about political influence over the media and socialism too. I've learnt to broaden resources and not rely on mainstream media - the more you can learn about our world we live in today. I love to read now, although I never really did at school! I don’t really watch too much TV but I do love a Netflix Binge (who doesn’t right?! )I’ve currently been watching Making a Murderer and The Staircase, both I thought were compulsive viewing and I can’t make my mind up about the verdict of The Staircase. I also absolutely ADORE the new remake of Dynasty; the clothes, ear rings, the GLAMOUR, the DRAMA! Fallon Carrington and Sammy Jo are my absolute idols!! The Walking Dead. I am actually addicted, season 9 is getting good but weird without Rick! Kimmy K would be the dream!!! ‘Bronze Salon 2019’ by The International Institute of Anti Aging. We have also become a Brand Ambassador in 2018 for The Eyelash Emporium and are now a crowned salon. These are huge professional accomplishments for me and mean the world to have these awards for the salon. City and Guilds Diploma in Beauty Therapy with Distinctions, Vocational Skills Charitable Trust Diploma in Salon Health, Safety, Security and Employment Standards, The Royal Institute of Public Health Certificate of Salon Hygiene, Vocational Training and Charitable Trust Diploma in Aromatherapy, St Tropez Classic Certificate, St Tropez Spray Certificate, City and Guilds Full Body Massage, Cafflon Professional Ear Piercing Diploma, Creative and Recreational Industries Hopi Ear Candle, Amirose International Diploma Eyelash Perming, Creative and Recreational Industries Brazilian Waxing, Dermalogica Stages 1-4, Guinot Diploma stage 1 and 2, Bio Oxygen Advanced Skin Rejuvenation, Spa White Operator Certificate, Energist Diploma for Hair Removal and Skin Rejuvenation, Lycon Cosmetics Certificates in Product Knowledge and Advanced Precision Waxing, Bio Sculpture Gel and Sculpture Certificate, Certificate of Credit for Sienna X Spray Tanning, CND Certificate in Shellac, Certificate in Nail Design and Advanced Techniques, Poppit Nail Treatments accredited by Nails Inc, Pellevé Skin Rejuvenation Certificate with Radio Surgery Thread Vein Removal, Skin Nutrition Programme Nutrition Level 1, Environ Diploma, Environ Diploma in Medical Roll Cit, Jane Iredale stages 1-4 Make Up, Environ Stage 2 Diploma with Skin Peels, Novalash Individual Eyelash Extensions, Eyelash Emporium Eyelash Extensions. I’ve recently qualified in BB GLOW and we are one of the first salons in the South to be offering this.